Bob and Linda got married at City Hall as per a framed photo on their bedroom wall.They proceeded to have a little life together on the shore, with a (somehow) four-bedroom apartment above a burger joint. They filled those rooms with quirky, "lone wolf" offspring, the most individual of the three being young Louise, who isn't interested in having friends. Linda, being a sort-of social butterfly who wants the best for her kids in all areas, pushes Louise to make a BFF, and she actually does. An interesting story, and I hope we have more of Jessica in the future. The weird thing was, though, of the Belcher children, Louise probably interacts with other kids more than the other two combined, especially if you consider the neighborhood twins! Tina, on the other hand, really needs to find interests that aren't boys! Her obsession with Jimmy Junior passed "annoying" a long time ago, and it's only a matter of time before I start screaming at her on television to get a life! Gene is enough of an oddball that it works for me, though it wouldn't hurt him to have a pal or two. 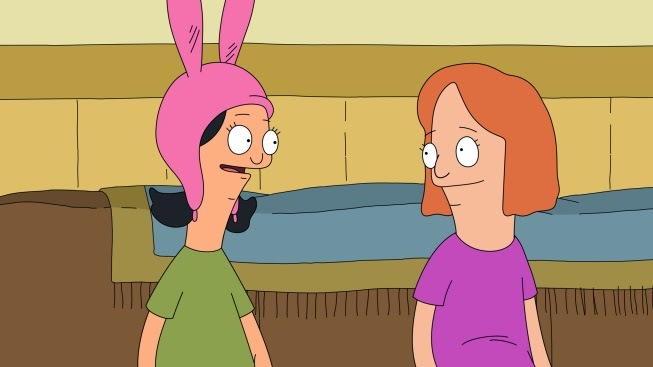 Bob's Burgers "Slumber Party" (S04E09): Linda tells Louise that she could have a slumber party to make a best friend, but the bunny-eared girl has no interest. So, Linda throws one anyway, despite the fact that Louise doesn't think any of the girls who attend are interesting. [she's such a cynic!] Linda leads activities like tie-dyeing and cupcake-decorating, but one kid goes to bed early (and pees her pj pants) and another freaks out about germs and wants to go home. While Bob takes the girl home, Louise works on getting the rest of the kids to leave, too. [I laughed pretty hard at that!] A story about Gene having a rough twin living in the basement sends one packing, and another leaves after Louise won't let her braid her hair. [what a strange reason to leave!] When it comes to giving the boot to the girl who went to bed early, though, it gets complicated.